Compared to outdoor surfaces, interior floors are exposed to fewer damaging elements. Although fewer, the damage it acquires still significantly make it unsafe and unappealing. Some property owners would choose to cover it up with carpet, tile, or any other materials. It is a sound option but it would require careful cleaning and tedious maintenance. Not to mention that such materials cost a lot initially. Why settle for that when there is a more affordable option? Decorative concrete offers different methods for improving or updating indoor concrete floors. Each one is designed to make the floor more aesthetically pleasing, more durable, and easier to maintain. With the right installer, the results are phenomenal. Stained Concrete – Concrete stains is a popular coloring agent for covering up ugly stains and discoloration. 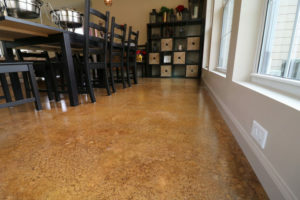 Acid stained concrete floors come in various earth tones that, when it comes in contact with concrete, causes a chemical reaction that is responsible for the unique effects and random color tones that appears on the slab. Water-based stains come in a wider selection of colors but dry to a more consistent color and a more opaque finish. Epoxy Flooring – Highly recommended for garage floors, this two-part coating cures to a very tough material that is seamless and resistant to damage. Although it looks good when it dries, it can be further enhanced with micro paint chips, acquiring a similar look to granite or terrazzo surfaces, or an exquisite metallic epoxy floors. Polyurea Polyaspartic Coating – Also a two-part material, the polyurea polyaspartic coating was meant for use on industrial floors. Its fast-drying feature made it a much-coveted coating for residential and commercial property owners who want a floor remodel with very minimal disruption at the shortest time period possible. Interior floors deserve top quality makeovers. Call (773)377-8976 to speak with one of our experts. Indoor floors need to be comfortable and durable, be it for residential or commercial use. But, of course, it would not hurt to make it gorgeous and easy to maintain as well. Chicago Concrete Resurfacing is a leading contractor that specializes in concrete floor repair, resurfacing, and refinishing. We are committed to optimizing your concrete surfaces at a rate that is within your comfortable range. We believe that you deserve to have the best without unnecessarily spending an exorbitant amount of money. Request a free in-home visit and quote today. Call us. We want nothing more than to work with you in making your dream floors become reality.